This piece on the Uzbek diaspora in the Russian capital opens a series of articles on Central Asian communities in Russia. It should be noted right away that an organized Uzbek diaspora as such does not exist. There is the Embassy and the Consulate General in Moscow, there are lots of Uzbeks and that is all. All attempts to organize them - and there were quite a few - failed to produce the desired results. Embassy of Uzbekistan is an extremely closed organization. Diplomats are permanently incommunicado. Phones are never answered and if they are, whoever answers inevitably refers the caller to some other official and hangs up. Author of this article reached Embassy Press Secretary Muzaffar Zahidov and asked for an interview for a piece on how people from Uzbekistan live in Moscow and for assistance in general. That was the last time anyone answered the phone in the Embassy. Some sources say that there is an organization of Uzbeks established by the Embassy. It is an organization of intelligentsia (blue blood). No information on it is to be had for love or money. It stands to reason to assume therefore that it was established just to enable some functionary to make a report and promptly forget all about it. "They arrange soccer matches every now and then - just to create the illusion of existence and activeness. They never meet with immigrants," Oleg Belkov said. Belkov admits that his actual priorities are somewhat different nowadays. An emphasis is made on propaganda of Uzbek culture and arts, establishment of a theater, unification of Russian-speaking intelligentsia because "culture is the only means of putting the diaspora together," according to Belkov. The Moscow Uzbek Community cannot even boast of more or less regular contacts with the Embassy, leaders of intelligentsia, menial workers, and ethnic Uzbeks as such. Ethnic Uzbeks are issued invitations but never turn up at whatever the Moscow Uzbek Community organizes. As a matter of fact, they prefer to stay clear of the structure - probably because it was established by a Russian even though he used to be a citizen of Uzbekistan once. Belkov himself admits substantial difficulties in communication with ethnic Uzbeks. He says they do not understand one another. And yet, Belkov claims that his organization is prepared to help immigrants in obtaining registration from the Russian police once a new law on immigration is adopted to make life a little bit easier for immigrants. That's a noble objective but exactly how Belkov intends to accomplish it is anybody's guess. So, the Moscow Uzbek Community is the only officially registered organization in the capital of Russia. A.D. Haidarov, the leader of St.Petersburg-based Umid, says meanwhile that numerous attempts were made to set up something else. (Uzbek diaspora in St.Petersburg is the subject of another article which is being prepared at this point.) Haidarov says he was regularly approached by "men from Moscow" seeking advice. Alidjan Jahangirovich was ever ready to offer advice. He even suggested the idea of a Moscow regional division of his Umid. Uzbek students of the University of Friendship of Peoples bent on organization of their own society were the last to call Haidarov. Unfortunately, not one initiative group ever appeared again after the initial consultation. The diaspora (if that is what it is) keeping a low profile, publication of the newspaper Uzbegim in Moscow is certainly an interesting project. This is a newspaper for the Uzbek diaspora and labor immigrants, published in the Uzbek and Russian languages. Five issues have appeared since last autumn. Writer Ulugbek Daliyev is the chief editor, businessman Habib Abdullayev the publisher. The newspaper has its own web site (Uzbegim.ru) where its issues are available along with other features including a forum. A community of former citizens of Uzbekistan is gradually shaping up around the newspaper - without a split into ethnic Uzbeks and Russians. Everyone who ever visited Central Asia or displays interest is also welcome. That is essentially all in terms of associations or organizations of former citizens of Uzbekistan in Moscow. There is, however, one other quite interesting organization of Uzbeks. It comprises Tajik Uzbeks. Some background first. The Tajikistan Foundation for Immigration and Law was established in Moscow to assist labor immigrants from this Central Asian country. It is fairly active and efficient. The structure is financed by the Soros Foundation and is literally bombarded with pleas for help. Experienced lawyers, doctors, and other officials are nothing if not highly efficient. The structure does not really care about ethnic origins but it is mostly the Tajiks who appeal for its help. The leader of an informal organization of Tajik Uzbeks approached it seeking help not long ago. The organization of Tajik Uzbeks is known as Buston. Officially, it is not registered and therefore does nor exist. Its leader has been in Moscow since 1999, menial worker on a construction site at first. He has been busy solving problems of his fellow countrymen for the last eighteen months or so. Momadsaid Urozaliyevich Barlasov is an ethnic Uzbek himself. That is probably why it is mostly Uzbeks who approach him though he would never even consider denying help to others. Barlasov can help with a great deal of problems. He meets newcomers, finds them lodging and a job, provides financial assistance at first, helps with transaction of salaries to families, raises the necessary sums to get an immigrant released from a police station, and so on. Whenever something more serious occurs (someone hospitalized or jailed in a special detention center for illegal immigrants), Barlasov seeks help from the Tajikistan Foundation for Immigration and Law. He says that it is Tajik youths who find themselves in trouble in Moscow more often than anyone else. "They come here without money. They even speak Tajik with difficulty, and as for Russian - they do not speak it at all," Barlasov said. What help Barlasov offers is not free, but what really counts is that this is an example of an actually working organization of Moscow Uzbeks. Appearance of an organization of Uzbeks from Tajikistan (even though it is fairly small for the time being) is probably attributed to how immigrants' families operate. As a matter of fact, immigrants from Tajikistan are so numerous that they have already established several formal and unofficial organizations. The matter concerns self-organization of ethnic Uzbeks who solve what problems they encounter in Moscow either on their own or with help from specialists of the Tajikistan Foundation for Immigration and Law. What also helps is that Tajikistan itself recognizes existence of labor immigration to Russia. These matters are discussed at the government level. Russia and Tajikistan even drew and signed several treaties on the matter. Immigration from Uzbekistan is not any less considerable, but the problem is ignored. The state does not recognize existence of the problem and does not bring it up. Ditto diplomats. That is why there are no organizations of Uzbeks or former citizens of Uzbekistan in Moscow. 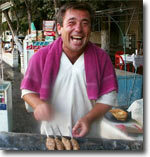 Web Site of Uzbek Immigrants (Fromuz.Com) is a vivid example of an informal association. The project was founded in 2003. It is the second most frequently visited web site dealing with immigration and also the second among web sites on Uzbekistan. Established by Oleg Danilov, once a resident of Tashkent, the web site "does not belong to any political force, state, public, or other organization or association." The project offers help to the Uzbeks throughout the world in finding friends and acquaintances and promotes Uzbekistan in the net. Natalia Aleksandrovna Zotova, a researcher with the Institute of Ethnology and Anthropology of the Russian Academy of Sciences. Zotova lives in Moscow.